Not only can you order THE BEST pecans, but some of the most amazing candies, cakes, and gift baskets you can find anywhere. I can still remember the smell of the candy kitchen when we walked in. Amazing! All that said, Sunnyland has become my source for the highest quality pecans. 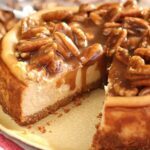 I used them in this cheesecake because despite it being easy, it’s something I wanted to best ingredients for. Now, I’ll admit pecans can be a premium ingredient, but nothing replaces the flavor of pecans. And like I always tell folks, when you’re on a budget, look for recipes that use pecan pieces rather than halves. They’re more affordable and work just the same in most cases. There’s no reason to buy the more expensive halves only to chop them up for your recipe. This recipe calls for halves on the top, because they’re prettier, but I promise you large pieces will work just as well. Now, let’s get to this cheesecake. Y’all I can’t even being to tell you how amazing this is. 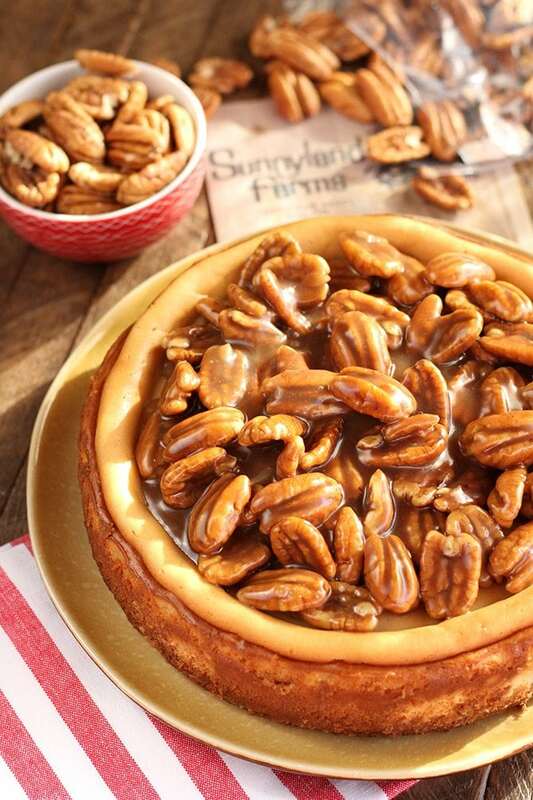 There are pecans in the crust and on top. I mean… gracious! First, let’s talk about how easy it is. Ok. Many cheesecake recipes call for a water bath and you’ve got to be all fussy about keeping it from cracking when baking. Well, guess what? It’s gonna crack. But you know what else? We’re gonna cover that sucker with the most delicious caramel and pecans; no one will ever know about that little ol’ crack. I’ve made this a few times and no one could believe that I made this. They all thought I had bought it somewhere. I’d say that’s a pretty good indication that it was good. So, go try it and prove to your family and friends you can make a dessert that’s on-par with the best bakery around. Y’all are seriously gonna love this one! In a medium bowl, combine the crushed graham crackers, pecans, and butter. Stir well. Pour the mixture evenly into the bottom of the spring-form pan and press firmly to create a crust. In the bowl of a stand mixer (or with a bowl and hand mixer) combine the softened cream cheese, brown sugar, and vanilla until well combined. Add the eggs and mix well. Pour the batter onto the crust. Lightly tap the pan on the counter to get out any air bubbles. Bake for 40 to 50 minutes, or until the center in almost completely set. Cool and then refrigerate overnight to allow the cheesecake to firm up before serving (or at least 3 hours for those impatient folks). 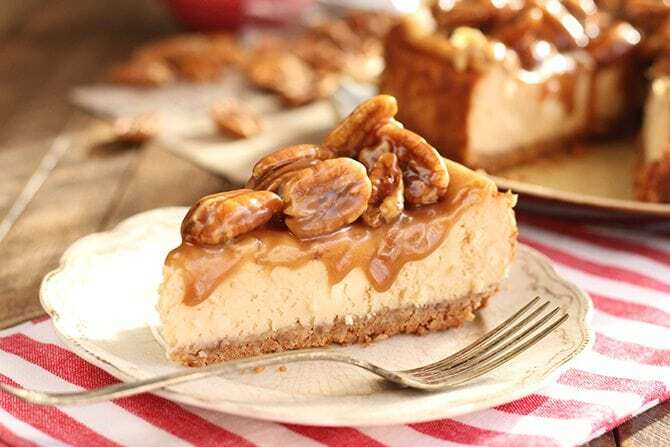 To make the topping, spread the pecans on a microwave safe plate and cook on high for about 3 minutes. In a medium saucepan, combine the butter, brown sugar, and heavy cream. Cook until bubbly, then stir in the toasted pecans. Cool to room temperature before pouring over the cooled cheesecake. This post is sponsored by my friends at Sunnyland Farms, but the thoughts and opinions are all my own – just as always. This looks awesome! Can’t wait to try it! Thanks so much for the recipe! I sure hope you’ll enjoy!!! Oh my! Does that ever look amazing! 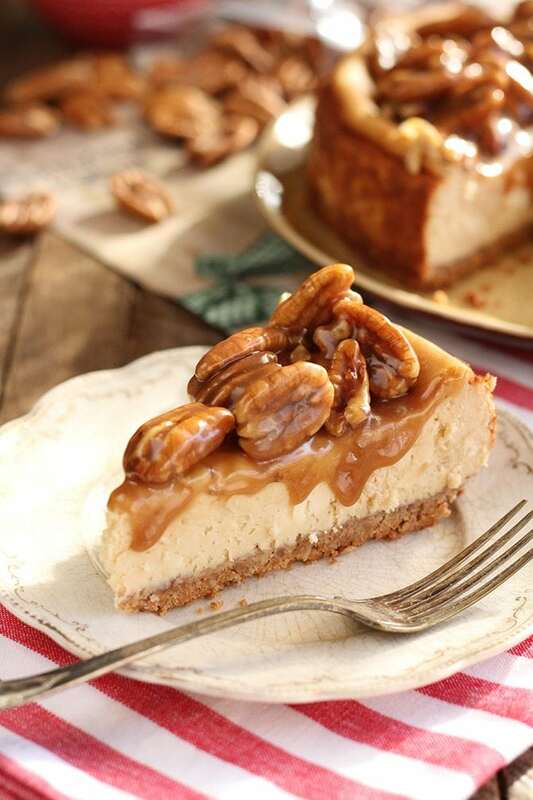 I love cheesecake and I love pecans so it’s a win- win for me. Pinned. Hi, can I use Dulce Le Leche in this somewhere? Ever since Christy (Southern Plate) introduced me to this wonderful stuff I’m like a maniac with a can opener! Best caramel I’ve ever tasted. Please please. I can stick to your recipe because it looks wonderful and since it’s Mardi Gras time here, this will be a welcome addition to the dessert table. Thank you. Sure! I think it would be fine to substitute the caramel in this with a dulce de leche. That is a gorgeous cheesecake. 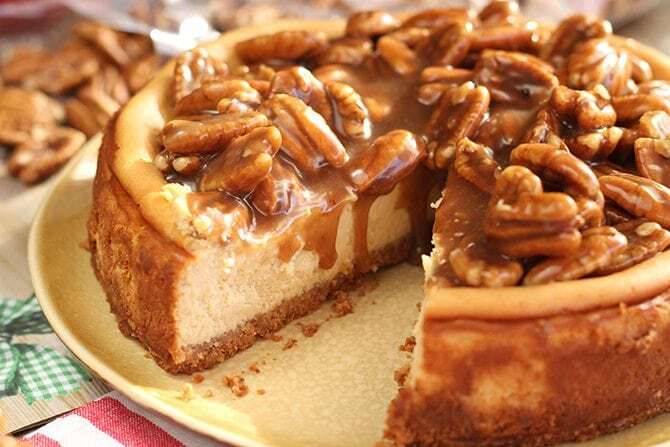 I love the flavors of caramel, pecans, and cheesecake. I am sure it tastes divine. DO NOT MICROWAVE YOUR NUTS FOR “ABOUT” 3MIN.. you will scorch them and they are expensive.. So glad I followed that rather than realize it was wrong.. luckily I caught it at 2 min before they all were lost. We now have chopped pecans as I couldn’t salvage much.. thanks a lot. I’ve done hundreds or maybe even thousands of pecans that way without scorching. Maybe you have a super charged microwave! 🙂 Sorry to hear you had trouble. In the future, I’m always happy to answer questions if something’s not clear. But keep in mind, manners will go a long way here. Having them will certainly get you a quicker response. Yeah holy cow no need to be so rude. I’ve tried hundreds of recipes over the last 5 years, some work, some don’t. I don’t hold the recipe written responsible for that. And what a waste of your time it must have been to have to google what temp to make caramel at. It’s seems you have absolutely no time to waste, even though you had enough spare time to bake a cheesecake and write a horribly rude review. Cons: Because of all the nuts on top its impossible to cut without squishing the whole thing down and therefore looks very messy once cut. I am gonna try to make it again doing individual cheesecakes in ramekins to save the problem of cutting and ruining the look! I totally agree. Sometimes I use chopped pecans which make it easier to cut, but the halves are so much prettier. Enjoy! I’m new too cooking dessert. I tried this and it was delicious… but I could only eat the middle cz the edges were too hard.. I don’t know if I over cooked it or what. Do you remove the springform pan and put it on a cooling rack? Cool to room temp before putting in the fridge? It sounds like it might have been a touch overcooked, but I’m not sure. Allow it to cool on the counter before removing the ring, then cover and refrigerate. I don’t have one of those pans, can I just make in a regular pan? You can, but might find it difficult to get the pieces out once sliced. Can I bake it in a water bath?? Of course! Just wrap the pan well with aluminum foil to prevent the water getting in. Can i use a premade graham pie crust? I’m afraid the filling won’t fit in a crust that size. Way too sweet! Use regular sugar in the batter. It was good though, whole family enjoyed but everyone agreed it was stupid sweet. Thanks! Ha! It’s dessert! It’s supposed to be sweet, right? Awesome, Taylor! So glad everyone enjoyed it!! My sis in law made this but i dont know if this is where she got recipe from.But I’m gonna try yours. It looks so good.(?) How much brown sugar in batter and how much in toppin to use?. I read comments.said microwave 2 min. Not 3.mins. . well i’ll let u know how it comes out when i make this for Christmas 2018. Thank u Stacy so much.. The amounts are in the recipe card above. When it comes to toasting the nuts in the microwave, if you’ve got a super charged one, you might want to start with 2 minutes. You can always add more time. Do i need to pre-bake the crust? and also will the cheesecake crack, since it’s being baked without a water bath? No, there’s no need to pre-bake the crust. And yes, the cheesecake may crack, but since we’re covering it with the topping, no one will see it. That’s the beauty of this recipe. It’s super easy and not fussy. Thank you for responding. and yes, it is super easy, most cheesecake recipes also require you to leave it in the oven for an hour after baking. This takes no time at all. Hi Christy! Yes, cracks are VERY common with cheesecakes. This is why I almost always make toppings for mine that cover up any cracks. The best way to prevent them is cooking them in a water bath, but I find it fussy and a lot of extra work.